Description: Wingspan 36-42 mm. Forewings ochreous grey to brownish grey. 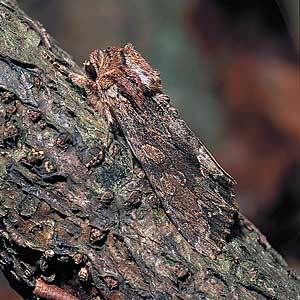 The basal area of the forewing has a series of black dashes and two white crosslines. Stigmata similar to the ground colour of the forewings but contrast conspicuously with the darker coloured patch between antemedian and post median lines. There are a series of small white marks along the edge of the costa. The subterminal line is strongly dentate. Hindwings light fuscous with darker veining. Similar Species: The Confused A. furva has a straighter costa; the dorsum has a scale tuft near the base (see text for the Confused). Status: Common and widely distributed across all counties including Rathlin Island, Antrim. Ecology: A summer species found in a wide variety of habitats especially woodland, fens and bogs. Adults become active after dark and appear commonly at light and flowers. It rests during the day hidden among grassy and other low-growing vegetation and is seldom seen. The larvae feed from autumn until spring on various grasses. It overwinters as a larva. World Distribution: Eurasiatic: In western Europe it is common throughout northern France to Fennoscandia.